It’s December. Only one month left in the year! 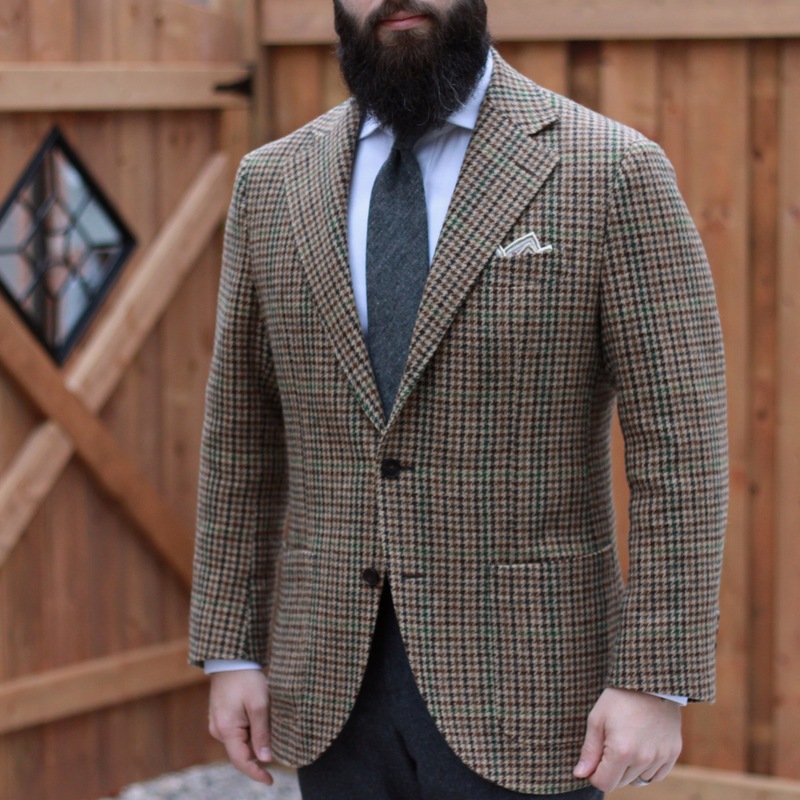 November was all about tweeds and flannels, and starting to introduce some layers. This past month’s notable additions: a pair of medium brown suede captoes from Morjas (review here! ), a new tie and pocket square from Suitsurmesur (review here! ), four wool ties from Cavour (yup – another review) and a beautiful black and white herringbone polo coat from Spier & Mackay. Let’s have a look at some favourites from November before I get to work on all these reviews piling up! This was the first outfit featuring one of my new ties from Cavour – it was also the start of Cavour week, where each day I wore an outfit centered around the ties I received from them. I think this outfit has a great colour scheme. 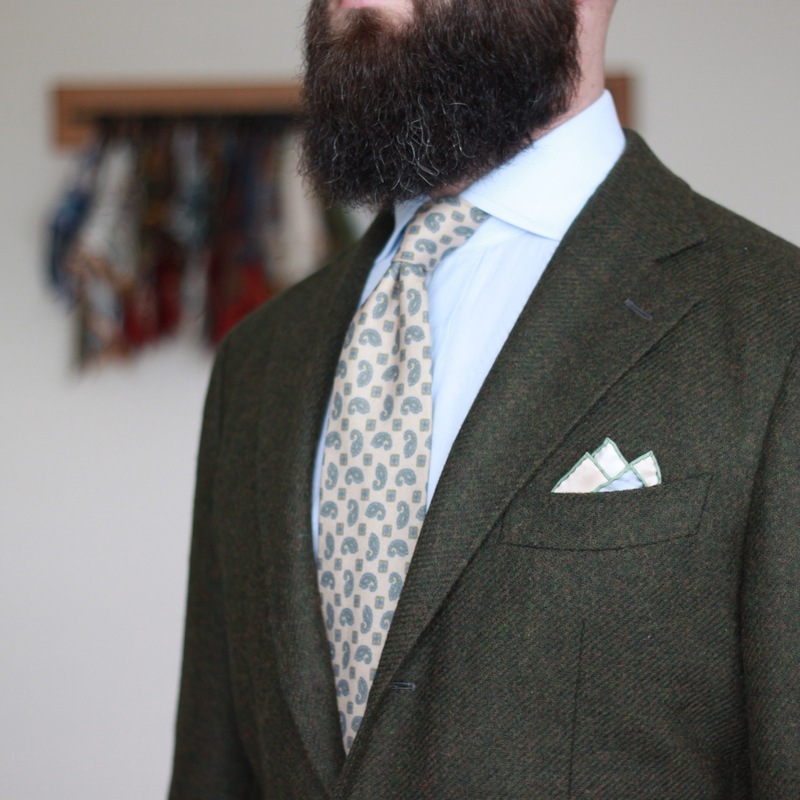 I’d been waiting to pair this green tweed with my camel flannel trousers, and this tie provided an excellent reason. This tie has an oatmeal base, and a paisley and square pattern done up in pale blues and greens. I chose my pale blue shirt to pull everything together, and added my Kent Wang Rickshaw Cart pocket square to finish it all off. This ended up being a very well balanced outfit, and is one that I’d wear again. I’ve imagined wearing this jacket with a grey tie for quite some time, but until recently all my grey ties were lighter in shade. When I got this mid-grey Donegal tie from Kent Wang, I knew I would try it out. The pairing of tie and jacket worked quite well to my eye, but in the full length shot I think that maybe a lighter grey trouser would have been better. I picked up mid-grey and charcoal flannel trousers from Spier & Mackay last month, and though I’m very happy with both, I wish I’d picked up the light grey also. Sadly, by the time their Black Friday sale came, my size was sold out. I think that has been a hard lesson for lots of people regarding Spier & Mackay lately – it’s not worth it to wait, as they seem to be moving product extremely fast! Anyways, back to this outfit. A simple white twill dress shirt plays neutral – my thinking was that with the grey trousers and tie, I didn’t want to introduce a cool blue to the colour palette. Since this jacket leans warm in tone, I wanted everything else to be neutral or warm. For the pocket square, I chose the Star Chart Cellarius from Kent Wang. It has a white base, but also a warm grey and some beige tones to it that I thought worked well with the jacket, and picked up some more of the greys in the outfit. Inspiration for this outfit comes courtesy of Simon @ Permanent Style. 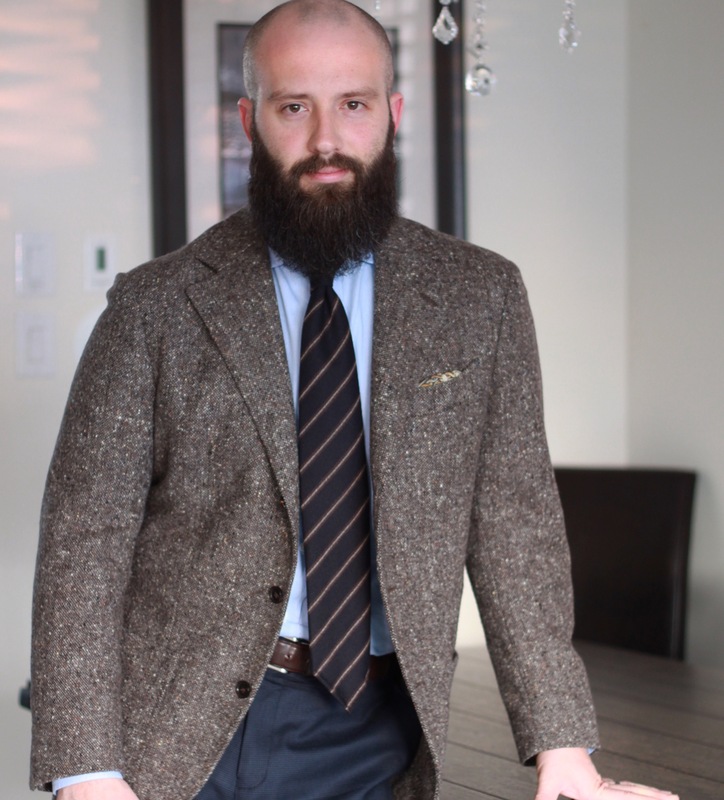 I wore my brown Botolli Donegal-style tweed jacket which is a wonderfully warm brown, and flecks of bright colours over a navy v-neck and lighter wash denim dress shirt. 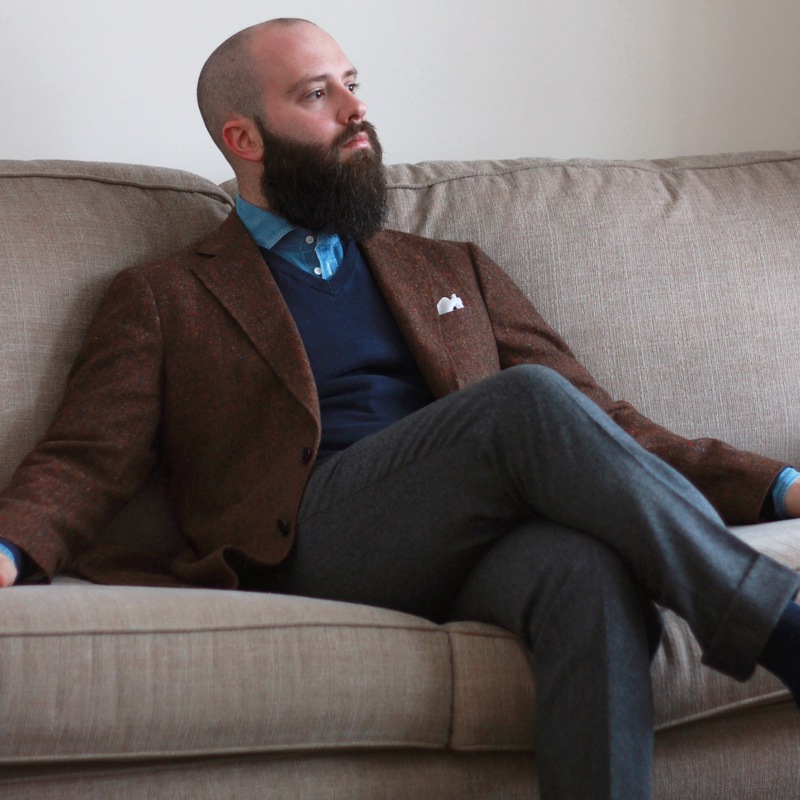 Mid-grey flannel trousers is the only real departure, and I like the lower contrast look. Finishing everything off is a simple, white cotton pocket square. I’ll definitely wear this again – it felt like a really good blend of casual and formal elements. Sweet, sweet Donegal. I love this heavy weight fawn Donegal. All natural, un-dyed fibres have so much visual interest. 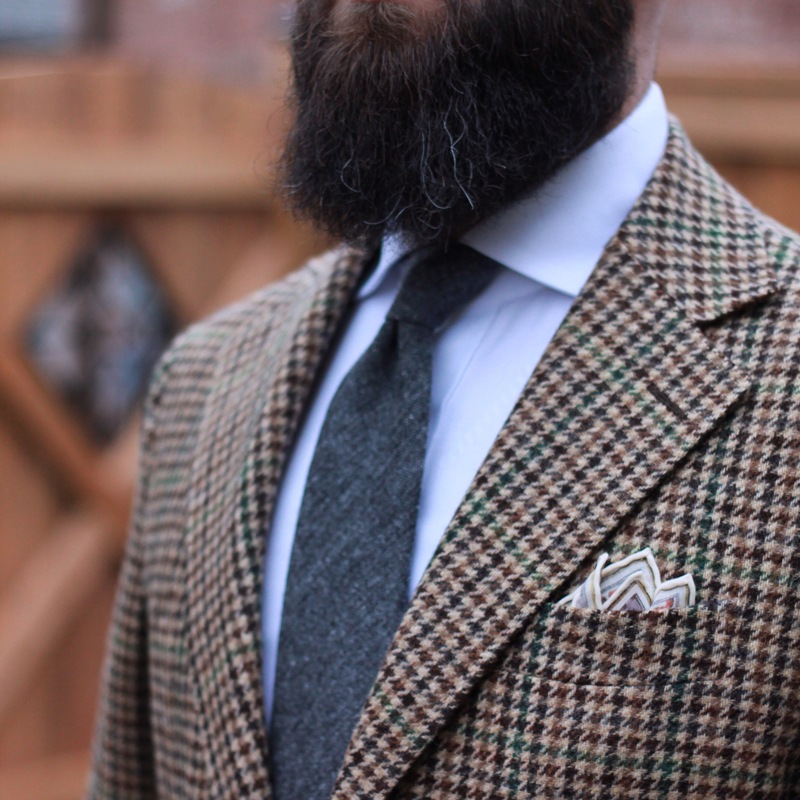 Here, I’ve paired it with my brushed wool navy houndstooth trousers. The greyish brown (or brownish grey?) jacket pairs so well with navy. I also chose my navy-based tie from Vecchio Anseatico. 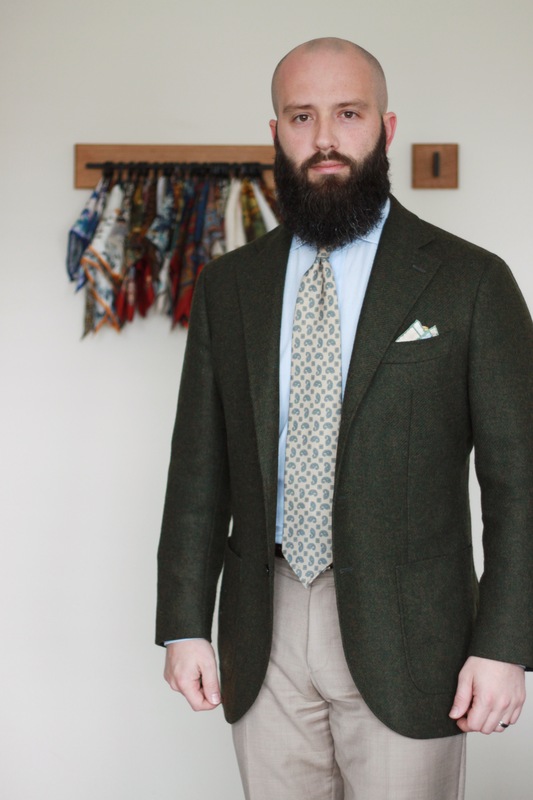 Keeping the houndstooh pattern going through the shirt might be a bit much, but the pattern on both shirt and trousers resolves to a solid from not very far away. In my breast pocket is the Lod Mosaic square from Kent Wang, which is a beaut. However, I’m not sure it was the best choice here. I think maybe something without a real pattern, and maybe a cooler colour would have been better. This one gets lost against the jacket a bit too much. It probably doesn’t help that it had slid down a little bit in the closer up shot. This outfit was a bit out of my comfort zone. 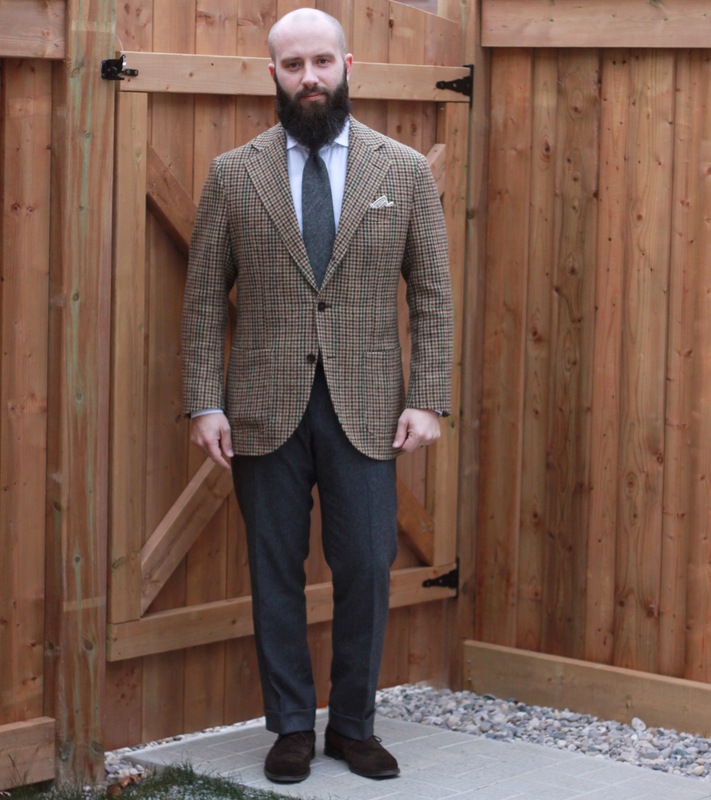 The burgundy flannel trousers and the jacket work really well, thanks to the colour of the check in the jacket. Choosing my chambray shirt and mid-grey donegal tie from Kent Wang was the stretch. 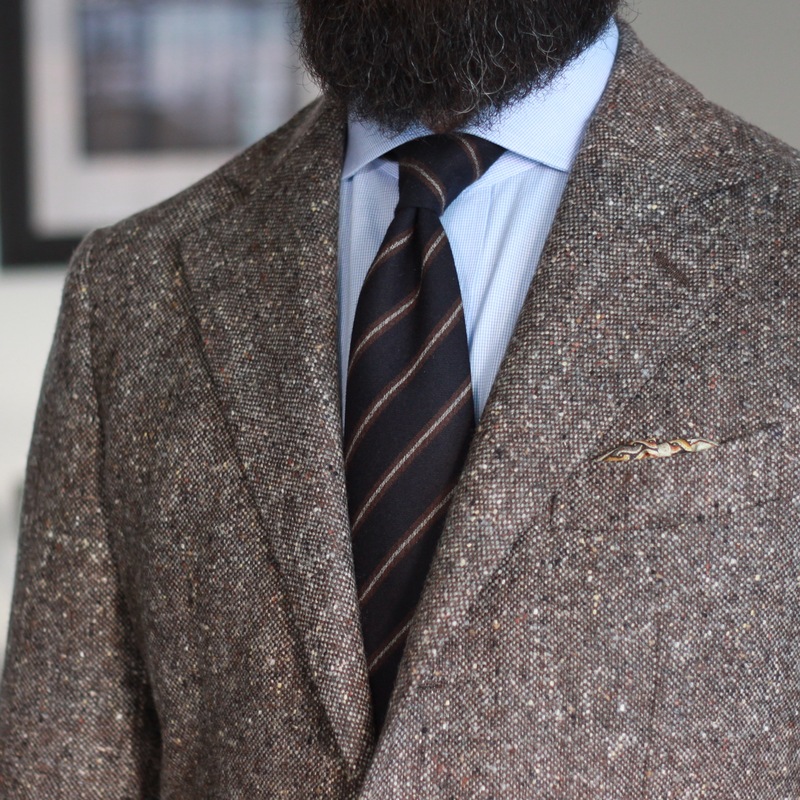 I quite like the grey tie with this jacket, but I worry that the shirt was too saturated of a blue. In the context of the burgundy trousers, picking a darker, neutral shade of grey for the tie also seemed to go against my instincts. Also, in the bright sunlight, the white pocket square is especially stark. But experimentation is key to growth, and overall I think this outfit worked well. The background of this shot is really cool – this field is basically at the end of my street, and offers a great alternative to the #menswearforest (it’s a thing, trust me). 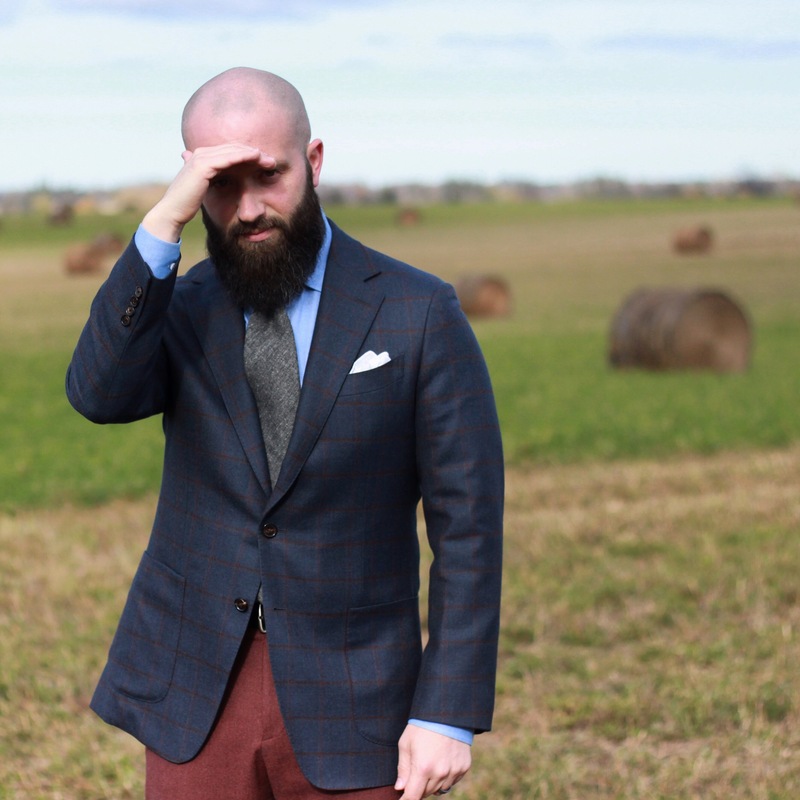 I enjoy the juxtaposition of formal menswear and rural environments. And there are fewer people to give me funny looks while I set up a camera to take pictures of myself! November was a great month for Fall/Winter fabrics. December will be a shorter work month, and I’m wondering how I can have some fun with it? I haven’t worn any suits for a while – maybe it’s time to break them out for a suit week? What do you think? Let me know in the comments while I go get started on those reviews.